Hurricane Michael is expected to hit the Florida Panhandle with winds of up to 150 mph. As Hurricane Michael approached the Florida Panhandle as one of the most powerful storms to hit the U.S. mainland midday Wednesday, the Federal Motor Carrier Safety Administration had issued emergency declarations in eight southern states. The declaration provides emergency relief for the transportation of supplies, equipment, fuel and people and will remain in effect for 30 days. It covers the following states: Alabama, Florida, Georgia, Louisiana, Mississippi, North Carolina, South Carolina, and Tennessee. The storm expected to be the strongest ever to hit the Florida Panhandle, an area that doesn’t typically see many hurricanes despite the state’s reputation for it. According to NASA’s Earth Observatory website, only three major hurricanes have hit near this region in the past 100 years. But Michael also may keep its hurricane-force winds as it moves over Georgia early Thursday, creating damaging wind and rain all the way into the Carolinas, which are still recovering from Hurricane Florence. Florence, which hit the East Coast in September, petered out as it made landfall, dumping tons of rain over South Carolina but avoiding more costly damage in a wide area. Hurricane Michael is expected to hit land much faster and bring with it damaging winds and storm surge, but not much rain. 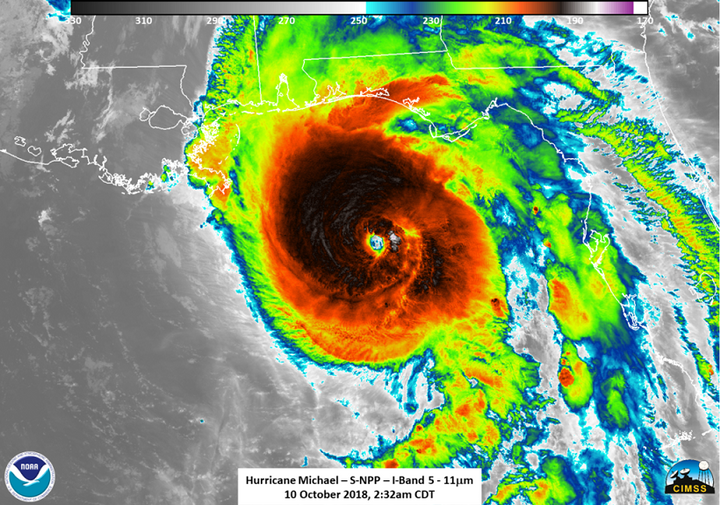 The warm waters of the Gulf of Mexico have strengthened Hurricane Michael into a category 4 storm. The emergency declarations include a temporary suspension of several trucking regulations. Carriers and drivers in direct support of relief efforts related to Hurricane Michael are granted emergency relief from Parts 390 through 399 of Title 49 Code of Federal Regulations. By lifting regulations, FMCSA aims to ease the flow of emergency goods, fuel, and aid to and from the region. The suspended regulations include those concerned with hours of service, inspection, repair, and maintenance, hazardous materials transportation, driving, parking, and other health and safety standards. The rules are only suspended while a truck is providing direct assistance. This terminates when transporting cargo or providng services not directly supporting the emergency relief effort or when a carrier dispatches a driver or commercial motor vehicle to another location to begin operations in commerce. Upon termination of direct assistance to the emergency relief effort, the carrier and driver are once again subjected to the normal regulations. However, a driver may return empty to a terminal or the driver's normal work reporting location without complying with Parts 390 through 399. Upon return a truck driver must be relieved of duty and receive a minimum of 10 hours off duty.